On this episode of The Writer and the Critic, Kirstyn McDermott and Ian Mond spend a little time talking about gender and reading in response to feedback received from one of their lovely listeners. Be warned, there may be some unqualified generalisations scattered about and there is definitely some drawing of disturbing stick figures. Kirstyn apologies for her barely suppressed laughter and also for the fact that listeners cannot see the horrified expressions on Ian's face -- or the disturbing stick figure -- that inspired said laughter. She trusts that listeners can use their imagination. 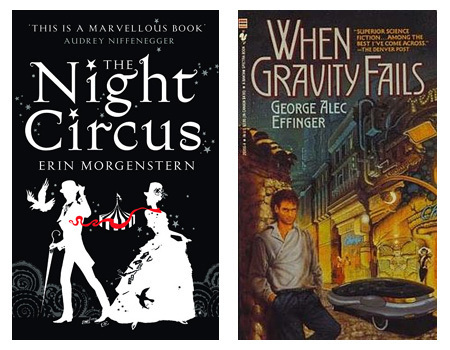 Around the 19:20 mark, the pair turn their attention to Kirstyn's recommended book for the podcast, The Night Circus by Erin Morgenstern. This review by Abigail Nussbaum is mentioned, as are the usual spoilers. Discussion of When Gravity Fails by George Alec Effinger begins at 56:25. Again, spoilers. Skip ahead at will. But don't forget to check back in around 1:34:50 for some (very brief) final remarks. Next month, Ian has picked Bad Power by Deborah Biancotti, while Kirstyn has chosen Sea Hearts by Margo Lanagan. Read ahead and join in the fun!